We’ve put together a simple chart that looks at the different points that your horse might injure. It’s important to check these points routinely to make sure that your horse is healthy and comfortable. To download & print the chart, click the image below. All steel products are susceptible to rusting when they come into contact with oxygen. 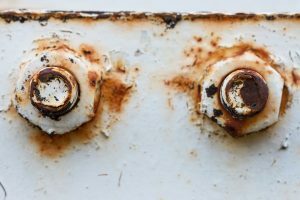 Rust can be preventing by painting over the steel or by hot dip galvanising. This is the process of immersing steel into molten zinc to coat it. Zinc bonds with the steel to form an anti-rusting and anti-corrosive coating. Hot dipped galvanised steel is used for many different functions including roofing, automotive parts and heating and cooling conduction systems. The coating has a lifetime of over 50 years in most weather conditions and requires hardly any maintenance. Hot dip galvanising is the process we use on all of our sheds at no cost to the client. It is the best and longest-lasting way to protect your steel. Many people consider this method more aesthetically appealing than the silver triangular pattern that zinc coating creates. Coating paints work well in protecting from high temperatures and insulating the steel from fire. However paint coating has a 12-15 year lifetime and the steel is exposed to rust if the paint is scratched, chipped or dented. Our sheds are wide and varied, covering a range of different purposes. And for every purpose, there’s a design, including custom-designed sheds. Below, we’ve included 6 of our top shed designs. The American barn is a real eye-catcher. The raised centre will make this shed stand out against the rest. It’s also a great way for maximising internal space and bringing in natural light, perfect for a workshop. An Australian style barn is slightly more modest & humble than its American counterpart. A simple roof makes this a very functional building, made for people who just need some space and don’t worry too much about impressing their neighbours. A 3-door garage is great for families storing their vehicles, but it’s also great for storage space if that’s all you need. The two-toned colourbond design looks fantastic. Some people won’t be parking vehicles in their building. In that case, a storage shed with some workshop space is a great option. The above shed has some glass roller doors, bringing in natural light and opening up the shed space inside. Looking for something a little bigger? A lot of our clients own farms and are looking for hay storage space. An open-sided hay shed is perfect for this. If you feel like embarking on a bigger project, some of our most beautiful builds have been habitable dwelling frames. Our clients often work with their own architects to produce fantastic spaces like the one above, a bed and breakfast in Mt Buffalo. Central Steel Build makes the News in New Zealand!